The fellow’s father, James Kirkcaldy, was one of the realm’s prominent Protestants, and young William worked in France as an English secret agent in the 1550’s while that same Queen Mary held court there as the consort of crown prince turned underprepared child-king Francis II. After Francis died in 1560, his widow returned to Scotland — not only as Mary, Queen of Scots but as a potential Catholic champion for the throne of England itself. As one might expect, Kirkcaldy was a king’s man. 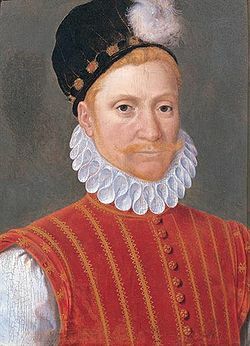 He beat Mary in battle in 1567 and took her prisoner, helping force her abdication; after she escaped and had another go at it, he beat her again, and Mary fled to England, never to see Scotland again. But a funny thing happened to Kirkcaldy on his way to the winner’s circle. In the jockeying that followed Mary’s flight, a fellow pol pulled him over to the Marian party. Kirkcaldy’s considerable talents now strained themselves for the return of the monarch and the curtailment of the regents. He lost. 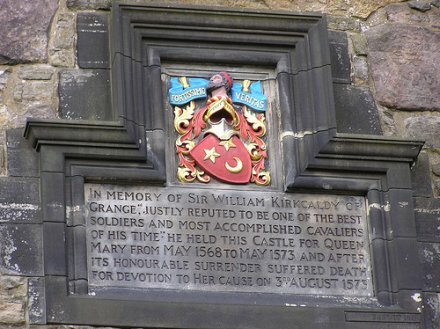 When it came again to open conflict, the king’s men (backed by aid from England) trapped Kirkcaldy in Edinburgh Castle and besieged it until the man was forced to surrender to the scanty mercy of his captors and the immortality of that latter-day plaque. (cc) image from Roblz Hurt. * James is notable in these pages for his adulthood penchant for witch hunting.